Warning: This is the rather confusing tale of a rather confusing 26 hours. There are many names of strange cities and numerous references to bus routes throughout this post. Trust me when I say that you don’t need to worry yourself with the details, but we made some handy maps for you just in case you’re curious anyway. We’re user-friendly like that. When it comes to this kind of travel, one of the most important things is to go with the flow. If there’s a bus strike in Peru and you can’t go anywhere in the south, then you decide where to go in the north. If you order lasagna and discover it’s filled with hardboiled eggs, you grin and bear it (and never order lasagna again while in Uruguay). If your hostal owner while cleaning your room goes inside your shoes, pulls out your socks, and then sticks them outside the window, you make your peace that she did it with the best of intentions. When Tim and I started planning our trip to Turkey, we knew we wanted to visit Ihlara Valley. Located about 2 hours by bus from our beloved village of Goreme, Ihlara Valley is 14 kilometers long, surrounded by tall cliffs on either side, and filled with ancient churches carved into the rocks. 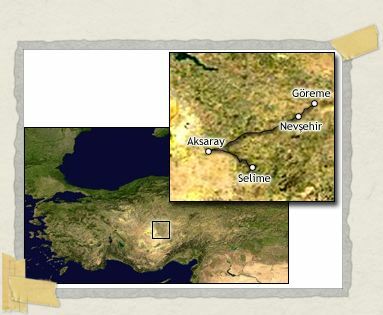 There are two tiny villages at either end of it, one named Selime and the other named Ihlara. And other than that, there’s nothing around. Most people visit the Ihlara Valley as part of a tour of the Cappadocia region. With the tour they’re able to walk the first hour or so of the valley, and then they’ll be on their way to the next site. But since Tim and I have a lot of time in Turkey, we figured we could spend more time at Ihlara Valley. Plus, we really wanted to walk the entire length of it. And so we decided to travel from Goreme to Selime on Thursday morning, stay overnight, wake early on Friday to walk the length of the valley, stay one more night, and then leave on Saturday morning for our next destination. It was a very straightforward plan. Which of course means that we did none of it. Leaving Goreme was very difficult for us. In our 17 days there, we absolutely fell in love with the little village. It was our home away from home. 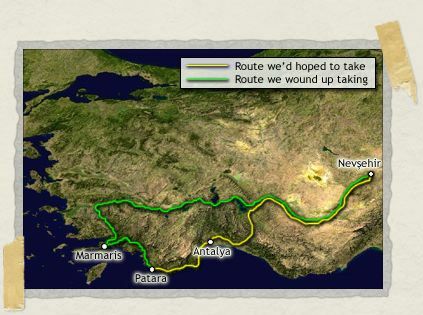 But it was time to go, time to explore the Ihlara Valley, and time to visit other parts of Turkey. So we left Goreme on a Thursday morning and caught a minivan to the nearby city of Nevşehir. In Nevşehir we hopped on the 11:45am bus to Aksaray. And in Aksaray we grabbed another minivan to Selime, the start of the Ihlara Valley. Tim and I had been operating under the assumption for almost 1.5 years that we needed to visit the Ihlara Valley. In fact, we thought it would be one of the highlights of our trip to Turkey. And so when we were faced with Selime in all its glory…well, first we were flexible and went with the flow. We went ahead and checked out the two pensions (hotels) that the village had. We looked at the rooms available, inquired on the prices, and made small talk with the owners. And then we listened to our instincts. We wondered why there were already shoes and toiletries in the supposedly vacant room that we were shown in the first hotel. We wondered if there could possibly be bodies in the basement of the creepy second hotel. And we felt ourselves thinking that things just didn’t feel quite right in either place. And finally, we began to question our assumption that we really needed to stay in Selime and visit the Ihlara Valley. After all, we realized, we had made those plans over 1.5 years ago when we were back in the US and before we had already explored dozens of other valleys in that region and visited hundreds of ancient churches. We had also experienced such a perfect time in Göreme, it would be hard to top it in a place offering similar sights. Not to mention, Selime wasn’t really the “small village” we had pictured. As Tim says, something out of the movie “Deliverance” is a more appropriate description. And while that in and of itself is fine for some folks, staying in either of the two pensions Selime offered was not fine with us. One of the things Tim and I pride ourselves on during this trip is that we try to research our possible next step whenever we can. 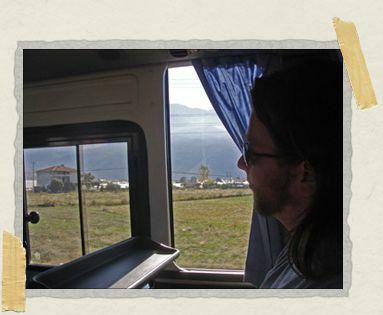 That means when we arrive at the bus station of any new town we’re planning on staying in, we make sure to check out the bus schedules and ticket prices for the place we think we might visit next. We had done such a thing when we had arrived in Göreme (via the Nevşehir bus station) 17 days earlier. And so we knew, while we were on the dusty and somewhat questionable road of Selime, that if we got ourselves back to Nevşehir we could grab the 9:00pm overnight bus to Antalya, a big city on the coast. 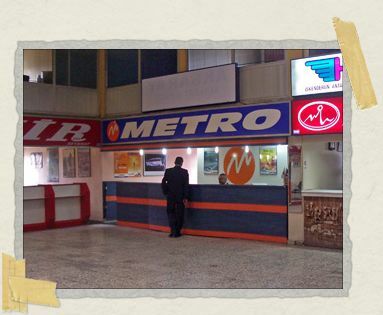 We also knew that the bus company, Metro, was one we liked and the price would be 30 lira each (about $22.50 USD). And although we would arrive in Nevşehir only a few hours before the bus was due to depart, it was overwhelmingly likely there would be room on it for two more passengers. And so three hours later (and a few interesting moments too, including some with a Turkish grandmother who refused to believe Tim couldn’t speak Turkish and enjoyed poking him on the shoulder angrily because of it), we were back right where we had started from earlier that morning: outside of Göreme, in the transportation hub of Nevşehir. Excited that we had made the right decision to leave Selime and the Ihlara Valley behind, we strode up to the Metro desk to purchase two tickets on the 11:30pm bus to Antalya. Temporary panic set in when we were told the bus was sold out. Well that’s ok, we thought, it just means we’ll spend one more night in Göreme and we’ll grab the bus scheduled for tomorrow night instead. And so we inquired about the bus the next night, overwhelmingly sure there would be tickets available as that is the case most of the time. And that’s when the frustrating thing happened. The man who had just told us the bus to Antalya was sold out for that evening suddenly declared that there were no buses going to Antalya. Ever. Given what he said made absolutely no sense, we asked him to repeat himself, and we were told again there were no buses to Antalya. Ever. We pointed out he had just told us there was a full bus going there that night, and that we had seen its seating chart on the computer in front of him. And he ignored us. It seemed, for whatever reason, this man did not want us to go to Antalya. The great thing about most bus stations is that there’s more than one bus company. And so Tim and I walked over to the counter next to Metro’s counter, and inquired if they had any buses headed for Antalya. It turns out they did, but they were also full. But they could get us to another bus station about halfway to Antalya. And from that bus station there would be a few additional buses leaving around 2am that would make the complete journey to our desired destination. The catch, though, was that he didn’t know if there were seats on those buses. It was quite possible, in fact very likely, that we would end up spending the night in a bus station that we didn’t know in the middle of nowhere. And while Tim and I have slept in a few bus stations and airports during this trip, the prospect of doing so on that particular night – a night which seemed as if everything in the universe was against us – was not appealing. So not wanting to spend the night in a bus station in the middle of nowhere, we decided to catch a minibus back to Göreme. We figured we’d come back to Metro in the morning (when a sane person was working at the desk again), purchase two tickets for the evening bus, and everything would be fine. Easy, right? So back into the bus station we went. It’s about this point that I decided I’m willing to spend the night there. After all, we’re familiar with that particular bus station, it has a restaurant of sorts, and it feels relatively safe. I reason it won’t be that bad. Sure the room is filled with enough smoke to kill within minutes, but it could work. Maybe we could stay a few nights, put up some curtains, add a touch of paint to the walls. With a little work, it really could be home. I am, of course, delirious. Tim, somehow, is not. At least not yet. And so he makes sure I’m ok in a corner of the bus station and runs upstairs to yet another bus company. He reasons that the universe doesn’t seem to want us to go to Antalya, and it doesn’t want us to go back to Göreme, and it’s silly to stay the night in the bus station, so there must be some other place we can go. And so one hour later we find ourselves on an 11:30pm overnight bus bound for Marmaris, a port city not unlike Antalya but on the opposite side of the country from it. Now that might sound a bit silly, but to us it was the perfect solution. You see, we never really wanted to go to Antalya itself anyway – we were only using it to get some place else, a tiny speck of a village called Patara. 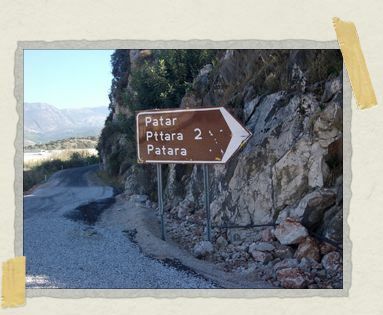 And not only could we get to Patara via this new route, we would get there a few hours earlier too. Sure it meant two extra hours of bus travel to do it, but all the better if it meant arriving earlier in our final destination. And so 26 hours after leaving Göreme and 8 (count ’em: 8) bus rides later, we finally arrived in Patara, via Marmaris. Exhausted and hungry, but safe and happy, we went about locating a new home for the next few days. It is Murphy’s Law, of course, that some of the more outlandish and amusing things happen to you when you are exhausted and hungry…and there were definitely some outlandish and amusing things that happened to us when we arrived in Patara that morning (including being trapped in a room by an overzealous husband and wife excited to see their first tourist in weeks, and being chased by a dog with a live chicken in its mouth). But you know, flexibility. It’s a good thing…particularly when you’re being chased by a dog with a live chicken in its mouth. I wonder if your socks were stinky and she was trying to freshen the room. I wonder why they didnt want to sell you a ticket to Antayla, I wonder what happened to the occupants of the room with shoes and toiletries. I wonder why the dog hadn't killed the chicken? This is like a nancy drew mystery…or at least a scooby doo mystery. I think more likely the Scooby Doo mystery, but at least you can laugh about it now! And you got some great views of the country, maybe, after the sun came up! p.s. congrats to Amie, Would have gotten it if i got to work on time!